Two at Symphony ... a casual café experience. Two at Symphony is the newest eatery at Dubai Mall, set in a modern-day space that combines the best of fashion and food. The name is inspired by two sisters, Mouza and Salama Alabbar, who joined forces to create a new modern-day space that combines the best of the two worlds – fashion and food – where handcrafted details, elevated experiences and beautiful designs come together as a whole. Salama is the visionary behind the flagship Symphony boutique that opened at Dubai Mall in April, and Mouza is the entrepreneurial and culinary sister. Their cafe, Two at Symphony, was opened in June and offers an elegant yet casual experience that brings to life flavourful comfort foods, beautiful fresh bakes and elegant sips inspired by the latest food trends and memorable flavours, according to a spokesman for the cafe. The interior at Two at Symphony is inspired by a modern-day ‘secret oasis’ and features a central bar (left) that adds dynamism to the ambiance. “Brought together with the Symphony experience, Two is a destination experience in itself, where guests can flow seamlessly into the fashion, accessories and floristry world of Symphony and then back to enjoy the culinary delights,” he says. The ambiance of Two at Symphony was designed to be elegant yet approachable, with the interior inspired by a modern-day ‘secret oasis’ in both look and feel. Designed by H2R, a prominent Dubai-based architectural and interior design consultancy, the concept brings a sense of elevated tranquility, giving customers a hand-crafted feel with hints of luxurious details. Soft pastel tones emphasise the openness and movement felt throughout the space, from the structural details to the furniture selection. 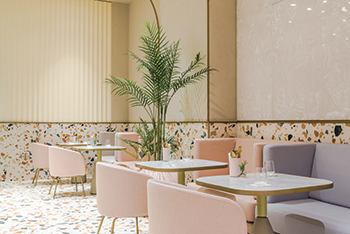 Striking features, such as the unique Italian terrazzo slabs, bring a fresh yet delicate feel to the interior while retaining a timeless elegance through the use of white marble and brass accents. The open entrance welcomes guests with captivating views of the cafe’s interior as the journey starts into a relaxed, yet elevated service-led experience where attention has been paid to every detail along the way. 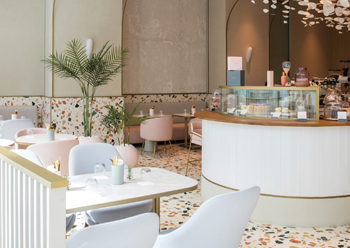 The central bar is a main feature of the design and serves to create a more dynamic and captivating story, with freshly prepared coffees expertly created by the in-house baristas sitting alongside indulgent and enticing bakery items. The illuminated petals featured in the central bar references the more organic aspects of the design and is meant to represent leaves falling in the wind; a gentle reflection on the continuity and fluidity of the design coming together as a whole across each moment throughout the ‘Two at Symphony’ journey. “As the guest transitions from Symphony, the same harmony is present in the airy, light feeling, as well as the celebration of quality craftsmanship. Subtle differences in textures and flooring create a gentle demarcation of each experiential moment with the design of the eatery, aiming to create a balance and symmetry between the sophistication of detail and colour, which when combined with texture brings an effortless relaxation to the space,” the spokesman says. An all-day modern boutique space, the cafe and eatery blends elevated dining with comfort foods, beautiful bakes and infused sips. The cafe presents unique dishes, indulgent desserts and handcrafted drinks that shine through a carefully selected international menu tailored to the local palette.